If there’s one thing that’s been a constant over the last decade in the technology industry, it’s the early leaking of upcoming phones on the internet. But where once it was just the odd whisper, a selection of blocky images or a slip of the tongue from an over-eager employee, now we’re in a world where the level of secrecy on new phone has slackened to the point where even the iPhone will be accidentally shown off by Apple ahead of its launch. The iron grip of secrecy surrounding a phone’s launch is undoubtedly slipping, with anyone interested in finding out what a brand is up to needing only to spend a few moments Googling to know pretty much everything that’s about to happen. The subject of leaks inspires fierce debate among tech fans. Does it ruin the surprise? Or is the search for morsels of information and the disseminating of salacious gossip the most exciting part of the launch – a thrilling chase that's more satisfying than the expensive catch at the end? Certain patterns of behavior are apparent in the leaks – or lack of leaks – from different manufacturers. Apple’s development of its iPhones has traditionally been cloaked in the most secrecy, while many of the Asian brands have traditionally been far more regular with the outpouring of information, raising questions as to whether the manufacturers themselves are doing the leaking in order to drum up interest in their new handsets. LG's behaviour has always been the most curious though. Where others let slip information quietly, LG will proudly announce key features of its new G Series flagship phones ahead of time, with the tech press in no doubt as to what they’ll be seeing come launch time. 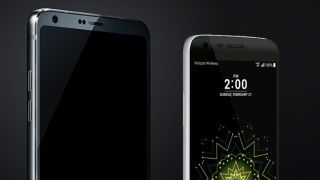 The LG G5 leaked in December 2015, three months before the reveal at MWC 2016. We recently reported on the forthcoming LG G6 launch in Barcelona later this month, and in that piece we questioned why LG would give away so much information with such regularity. Surely it ruined the surprise? To our surprise this struck a chord with a source within LG, who consented to an interview with TechRadar over its pre-release strategy under the condition of anonymity, in which they finally explained why the company's new handsets are splashed all over the internet ahead of their glitzy press conference unveiling. TR: How long before launch was the LG G6 conceived? LG: Generally we start developing a new smartphone a year and a half before launch. So for about six months you have two teams working on different products simultaneously, one as it's finishing and the other as it's starting. TR. We often see early prototypes of new phones leaking months ahead of launch, with features that don’t make it to the final model. How many prototypes typically are made of a flagship phone? LG: There is no set number – it depends on the particular device, and how close to expectations they come at the early stage. TR: At what point during the LG G6's conception and creation did you expect to see it start appearing on the internet? LG: Generally, consumer and media interest in a phone starts about three months before the expected announcement date. Interest in the upcoming G phone has been particularly high, probably because there was so much speculation in the beginning as to whether it would be modular or not. Surprisingly, we've seen more coverage of imaginary images of the new G-series phone than we saw with the G5, which was unexpected because we thought the early speculation that the G5 would be modular was what was driving the buzz. I guess we were wrong. TR: Where do leaks typically come from? Are they seen as a positive or negative thing within LG? LG: While we would prefer to be able to control the flow of information, it gets tougher and tougher with each new phone. I mean, if a candidate for the American Presidency can't stop her emails from leaking, what chance do we have? Joking aside, this is a whole different world than 2010, when a prototype phone from [Apple headquarters] Cupertino ended up in the wrong hands. "It gets tougher and tougher with each new phone"
You simply can't undo something that gets released online, it's out there forever, and there are so many touch points these days, from suppliers to retailers to case makers who have access to devices before they're official. So we like to think that information that gets out before its time just proves how much interest there is in the product. And with the new G phone, there's been plenty of interest, which we're happy about. TR: We saw the early pictures of the LG G6 in January; is that earlier than you'd like for the phone to be shown off? At what point are you okay with elements being seen? LG: We’re less likely these days to spend too much time, energy and resources trying to find the source of a particular leak. Hey, it's out there so you can't turn back the clock. We try to make the best of it... lemons into lemonade, as they say. TR: Do you get wind of a source having a leak before it goes live, and if so what can be done about it? LG: We see the details and images online, like everyone else. On some occasions we'll see details pop up first on some Russian or Chinese site that the English [speaking] media hasn't caught wind of yet. That gives us a little bit of time to prepare ourselves for the inevitable questions as to whether that story is accurate. Of course, we don't confirm or deny anything. TR: LG’s internal divisions – LG Display in particular – often announces they're going to be bringing their latest product to the next iteration of the G series. What’s the benefit to LG of different divisions confirming they'll be supplying for the next flagship phone? LG: Well, you have to remember that our suppliers aren't only supplying to us. By announcing a component in an upcoming smartphone these partners are generating interest in other smartphone manufacturers who are planning their next products. If you have a big customer, you want smaller customers to know that. TR: Why does LG release the name of its flagship phones ahead of launch? LG: In the past we didn't. But we thought that with the G6 it was already such a well-known assumption that we didn't see much of a benefit in playing coy until February 26. After all, what were we going to call it – G7? TR: What’s the benefit of having a press conference at an expensive event like Mobile World Congress when you could just spend more time leaking / previewing the phone on the internet? LG: Press events give companies a chance to set the record straight, to control the message one hundred percent. Even today, no one actually knows for sure which story is accurate and which isn't. And this is why it's more important than ever that we have official announcements, so we can help separate rumors from fact. Think about this fact: even though there are more and more leaks every year, more and more people turn up at our press events at MWC. That tells us that journalists still want to hear the truth from an official representative, and actually touch and feel the product, something that one can't do with a story or photograph. TR: In our experience, every other big phone brand is petrified of leaks, and works to ensure that as few details as possible emerge before the big announcement, so why does LG take an alternative view? Does being so open bring any tangible benefit? LG: Petrified is a strong word. We don't like not being in control of the communication process, but that's life in the digital age. We're realistic. And at the end of the day, if someone doesn't think he or she needs to attend an unveiling event because all the information is already out there, I say fine, let's save that seat for someone who wants the real hands-on experience. We can live with that.